For the first time, high impact graphics are now portable for internal and external applications. There is no need for bespoke framing or a specialist installer. Portability and easily changeable graphics means both reduced costs and reduced setup time. The graphics area is up to 2.5m high by 3m wide. Two large water tanks make the feet at either side of the unit and additional water tanks can be added across the middle support bars for extra stability in mild winds. Height is adjusted with two telescopic poles between the two sides and springs provide tension. The unit is easily assembled and packs away in two canvas carry bags for transportation. 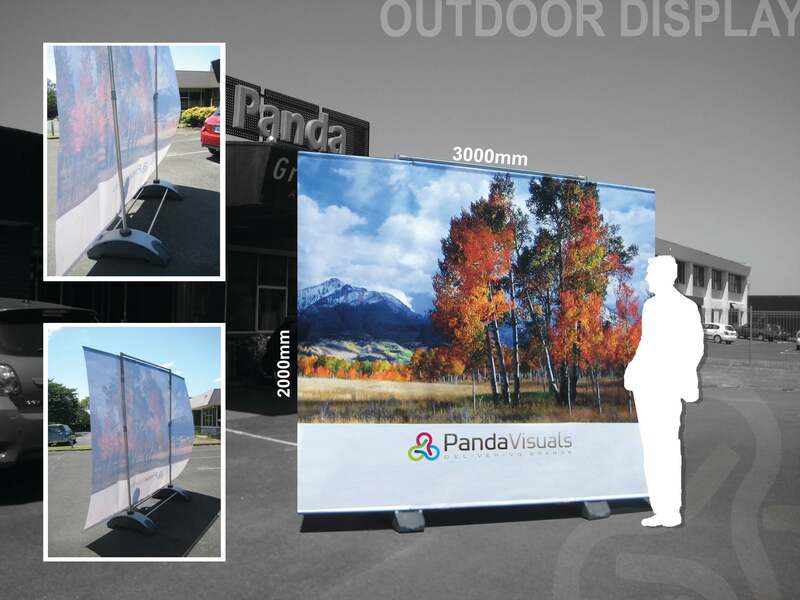 To order a Big OutDoor for your business, give us a call on (09) 970 6209, send us an email or use our enquiry form.